Click on our "AVAILABLE" pages above to see our available babies! Located in Sylvania, Georgia, Dogwood Gap Kennels is the happy place for puppies! My name is Melanie Clark and I have loved dogs my entire life with over 25 years of breeding experience. We are home-based breeders of AKC/CKC Pomeranians. We are NOT a puppy mill. Each Pomeranian gets individual attention daily, with special playtime and yummy treats! We are STATE LICENSED by the Georgia Department of Agriculture's Division of Animal Protection (100% compliance), AKC INSPECTED (100% compliance), and totally BRUCELLOSIS-FREE. We uphold the very highest breeding standards in order to give you a loving, purebred puppy! All of our pups are vet-checked with first shots and wormings, and always health guaranteed. 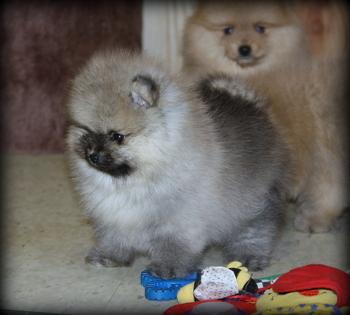 Our Pomeranians range in size from 3.5 to 7 lbs. and come in different colors. We specialize in very small Pomeranians. Since small breeds need plenty of tender loving care, we want to assure that our babies go to only good, loving homes. Pomeranians need lots of attention. We have started them on their road to a long and happy life by already spoiling them. We want to find each puppy a suitable, loving home. Feel free to call me on my cell at 912-425-9332 with any questions or inquiries about our puppies or upcoming litters. If I can't answer my cell at the moment, please leave a message and I will return your call as soon as possible.